Nokia announced earlier this week that it has put the finishing touches on its Nuage Networks Virtualized Network Services (VNS) platform, readying it to fulfill today’s enterprise needs for secure, end-to-end control of SaaS-oriented multi-cloud IT environments. In particular, the company has added intelligence for more efficient handling of SaaS applications — for example, taking into account different availability time zones. And, it’s added dynamic security threat response capabilities that allow enterprises to program their networks to respond automatically upon detection, said Hussein Khazaal, VP of Marketing & Partnerships, in a No Jitter briefing. Enterprises are looking to reduce the time to detect and react to threats down to zero, Khazaal said. With its security enhancements, Nokia aims to allow enterprises not only to protect their networks, but if a threat occurs, to respond to that threat dynamically — regardless of where it pops up. For example, VNS can detect threats at the branch, in a partner network connecting to the WAN, or in the data center, he added. 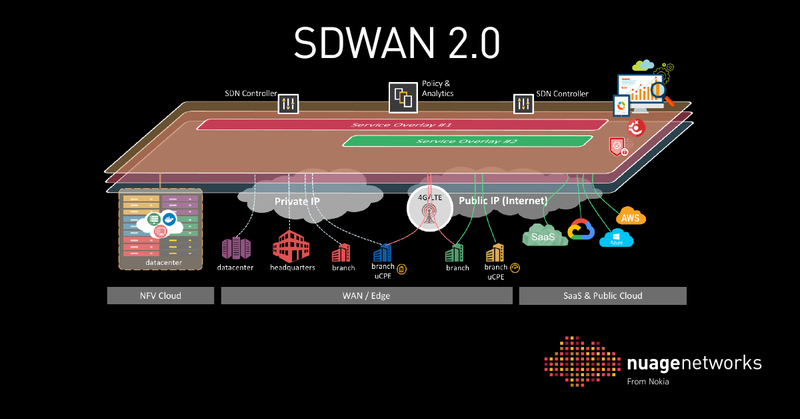 With the ability to control and protect application traffic end to end across multiple cloud environments and from the branch to the data center, Nokia touts its SD-WAN technology as second generation, or SD-WAN 2.0. The desire to increase bandwidth and be more agile, application-aware, and secure — not only at the branch but the data center too — is what’s driving enterprises to next-generation SD-WAN technology, Khazaal said. For Nokia, this includes organizations such as the University of Pittsburgh Medical Center (UPMC) and Banco Multiva, in Mexico City. VNS provides Banco Multiva “crucial end-to-end policy-based network automation and security, giving us full visibility on the connectivity conditions of our branches in order to procure an outstanding customer service,” said Michel Bouffier, CIO at Banco Multiva, in a prepared statement. Analysts up to speed on VNS credit Nokia for taking the next step in meeting the evolving enterprise expectations of this technology. Cliff Grossner, a senior research director with IHS Markit, put it this way in a prepared statement: “Ensuring a high-quality user experience with applications distributed across the multi-cloud makes secure, high-performance adaptive connectivity an imperative.” The company’s focus on providing a secure virtual networking fabric for multi-cloud environments “answers an important market requirement,” he added.